Accelerator Websites specializes in websites for small and mid-market professional services firms including accounting, consulting, speakers, attorneys, and architects. Top-quality writing, clean designs, and search engine expertise. For faster service please email us. We check email on the weekend and we’re just better at responding to you via email than any other method. Accelerator Websites is a division of Sandra L. Leyva, Inc. If, for any reason, you are not completely satisfied with the website, you can cancel any time. No questions asked. 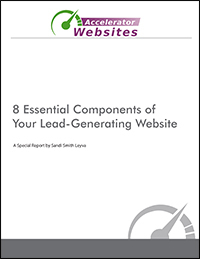 Get Our Free Report "8 Essential Components of Your Lead-Generating Website"